Our Superflex chain harrow section is designed to be compatible with Parmiter frames and drawbars. Manufactured from 1/2” diameter high quality carbon steel ensuring that the harrow is extremely strong with a high resistance to wear. The section is supplied in 3’-3” widths x 7’-6” depth. By William Hackett Chains Ltd based in Halesowen, UNITED KINGDOM. By EO Culverwells Ltd based in East Sussex, UNITED KINGDOM. By Ralph Bridge Chain Harrows Ltd. based in Belwood, ONTARIO (CANADA). By Lyndon Harrows and Engineering Ltd based in Canterbury, NEW ZEALAND. 6' mounted Beaco chain harrows. Full range available, please see our site for details. A Concept so simple you won't believe it! A Tool so rugged and reliable that you wonder why all machines aren't built this way! Light tillage like you've never seen before. 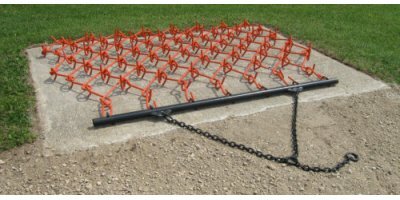 Standard model comes with bars and the spiked chain harrow. Rotating rings means less wear. Spikes for pasture rejuvenation and manure spreading can be turned over and used for seed covering. 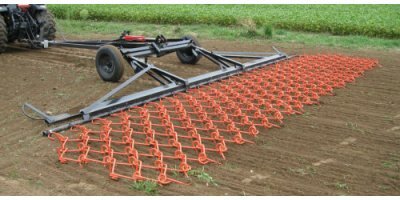 This unique lift system allows you to transport any chain harrow. You can also detach the lift mechanism & use the boom pole for other lifting applications. Folds to just over 4ft width. 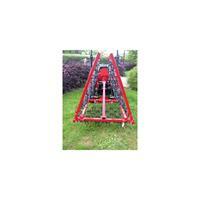 Ideal for compact tractors and premises with small entrances. 12mm tine thickness. 3 point linkage mounted. 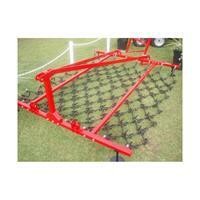 This 3 way use chain harrow range offers the user flexibility that other harrows do not offer. ' Aggressive , Passive or Flat ' Depending on the direction of pull. By Tri Green Tractor based in Frankfort, INDIANA (USA). 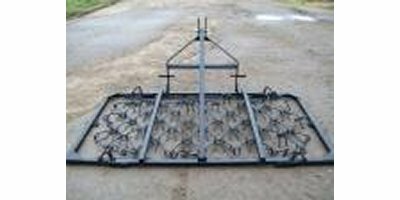 Now, with over 30 years experience in the metal manufacturing industry, JPC Turfcare (the agricultural & horticultural division of J&P Contracts (Angus) Limited) offer a range of frame mounted chain harrows suitable for use on numerous applications such as sports & recreational areas, Paddock & pasture.